Plastics are selected primarily according to their mechanical and thermal properties, their suitability for processing and their price. Then, after careful selection, it’s often found that the surface doesn’t meet requirements. However, the surface is the only material property that can be changed independently. Very often, gas-phase fluorination is the solution of choice. Plastic surfaces are fluorinated by exposing them to a fluorine mixture. 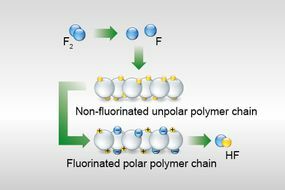 Due to its high reactivity, fluorine partially replaces hydrogen atoms in the material surface. Its properties are modified mainly by the higher surface energy and the surface polarity. 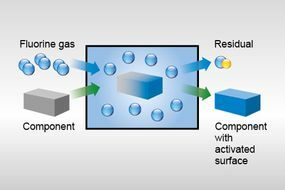 Systematic process control allows the result of the fluorination process to be optimally adjusted to the original polymer and the specified application. Fluorination is a chemical reaction, not a coating. Accordingly, fluorine atoms penetrate the substrate’s molecular structure. The process doesn’t affect the properties of the base material, and its dimensions remain unchanged. All relevant treatment parameters are adjusted to the product and the specific objective of the treatment during a test phase. The values obtained are then applied as a formula for series production. Three-dimensional parts are treated in a discontinuous process. They are pre-treated in a vacuum chamber according to the formula specifically developed for the purpose. Small parts of only a few mm in size are fed into the cylindrical chamber as bulk material. The cube-shaped chamber accepts larger or mechanically sensitive parts in crates, grid boxes or transport units. These may fill the chamber almost entirely. Fluorination is the method of choice even for thermosensitive parts. The treatment is applied at steady, low temperatures, usually at room temperature, avoiding local temperature peaks. 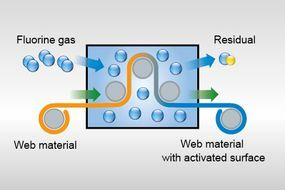 In an inline system, web material is fluorinated in a continuous process. Treatment results are determined by throughput rate and fluorine concentration. The system is designed to treat a wide range of web materials of varying thickness and widths of up to b = 2.100 mm from roller to roller. The bond energy of the carbon-fluorine compound created in the surface is extraordinarily high. Accordingly, the process of fluorination is not reversible. The surface properties achieved remain stable over long periods. 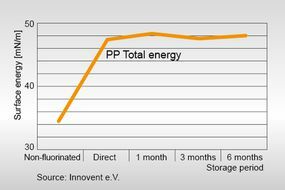 Gas-phase fluorination yields absolutely consistent application results. Cavities, undercuts, recesses and wraps, as well as textured and coarse surfaces, are treated homogeneously and without any shadowing. This ensures a consistently high treatment quality right down to the most remote corner of the component.